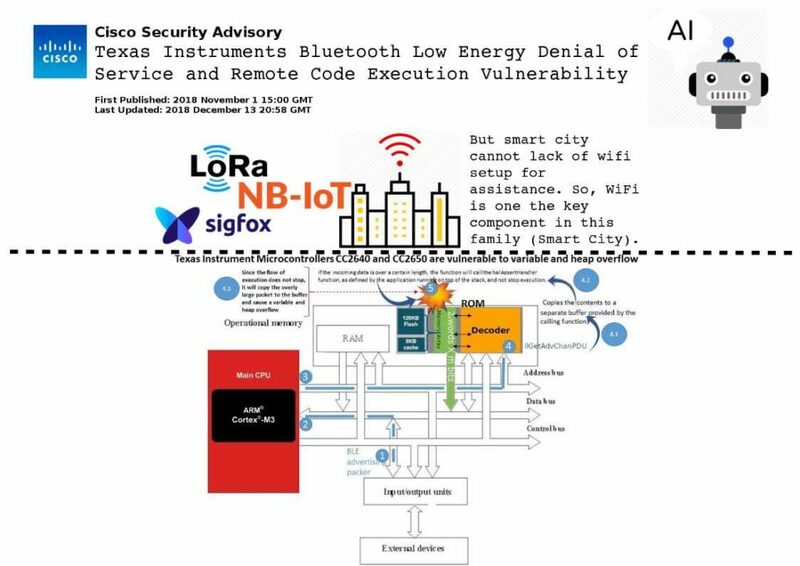 Cisco Security Advisory – Texas Instruments Bluetooth Low Energy Denial of Service and Remote Code Execution Vulnerability – Last Updated: 13th Dec 2018. Preface: Key component of smart city are the IoT devices. The communication protocol of the IoT devices are Lora, SigFox and NarrowBand (NB). Background: In realistic, smart city cannot lack of wifi setup for assistance. So, WiFi is one the key component in this family (Smart City). Vendor Cisco follow up TI BLE chips vulnerability – CVE-2018-16986: Suggest verify with the following command on wireless AP device. If device show not support BLE function and therefore confirm device not vulnerable.